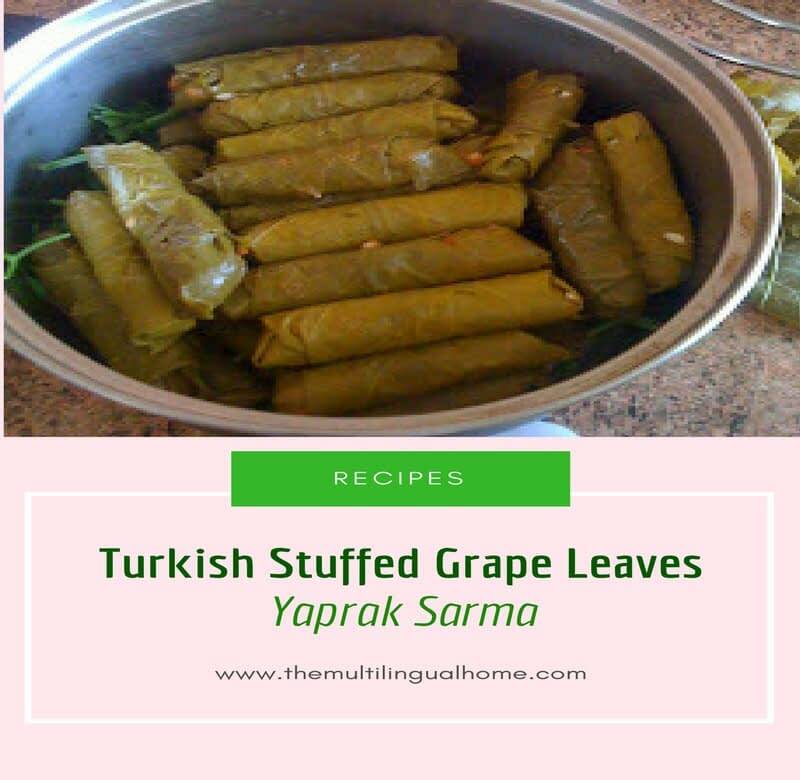 Another staple in Turkish cuisine as well as Middle Eastern cuisine are grape leaves. Often you can find stuffed grape leaves at a restaurant or in a can, but homemade stuffed grape leaves are obviously better. Most of the ingredients can be found right in your pantry, also they are vegetarian-friendly or can be made with ground beef. 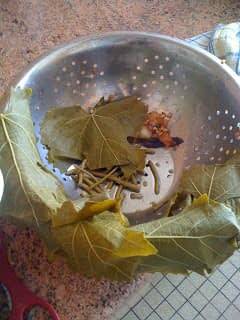 The only ingredient that might take some time to find are grape leaves. 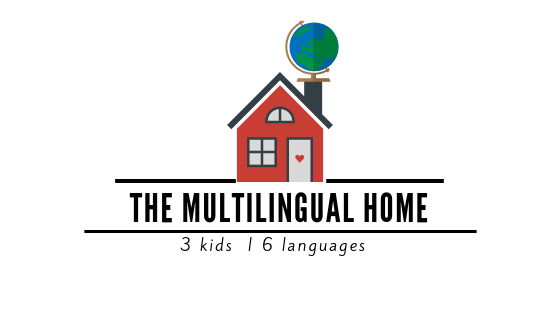 If you are in Europe, these will not be that hard to find. A pack of 50 can be found in any Turkish grocery story for about 2,50 euros or you can pick them fresh while in Turkey. My mother-in-law once sent me home with a bag of 200. 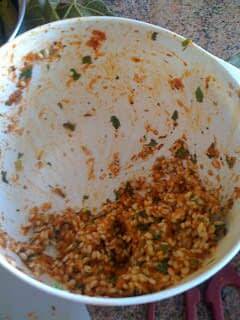 It may seem like a lot but when you end up making the recipe over and over again, you run out quick! 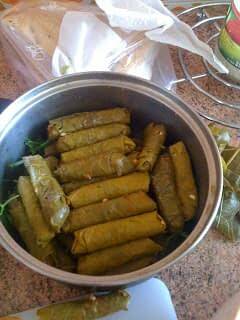 The term sarma derives from Turkish verb “sarmak,” which means to wrap or to roll. It can be prepared with rice and spices (vegetarian) or with rice and ground meat. Both are delicious. To find a recipe with ground meat check out this one. 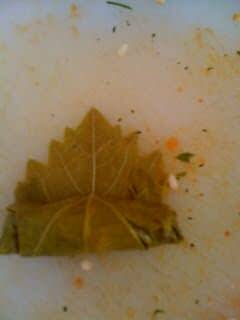 I prefer to make my grape leaves the vegetarian way, because I usually make dolma (stuffed peppers, another interesting recipe to come inshaAllah) the same night. Recipe posted below the pictures. 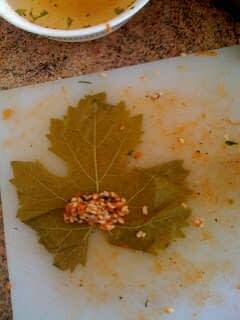 Put one leaf (the shiny side down, the veiny part up) and a little of the rice mixture in the leaf and fold tightly. Put in a pot, until they look like the picture above, I usually line the pot with parsely stems or lettuce. Fill the pot with water about half-full and then cover with a small plate and cook for 20-30 minutes or until the rice is tender. Have you made stuffed grape leaves before or have you tried them in a restaurant ?